RESEARCHERS HAVE DISCOVERED a new site of around 50 tracks from dinosaurs that roamed the Isle of Skye, Scotland during the Middle Jurassic. The study backs up previous discoveries of dinosaur fossils and markings on the island. The series of footprints discovered belong to sauropods, which stood up to two metres tall, and by similarly sized theropods, which were the older cousins of the tyrannosaurus rex. The find has been deemed “globally important” because the discovery of fossils from the Middle Jurassic period has been limited to a handful of sites around the world to date. Researchers measured, photographed and analysed about 50 footprints in the tidal area of Brothers’ Point. They said the footprints were difficult to study because of tidal conditions, the impact of weathering and changes to the landscape. Despite this, scientists identified two trackways in addition to many isolated footprints. The researchers used drone photographs to make a map of the site. Additional images were collected using a set of cameras and tailored software to help model the prints. Analysis of the clearest prints allowed scientists to determine they were that of sauropods and theropods. “This track site is the second discovery of sauropod footprints on Skye,” Paige dePolo, lead author, said. “It was found in rocks that were slightly older than those previously found at Duntulm on the island and demonstrates the presence of sauropods in this part of the world through a longer timescale than previously known,” she said. 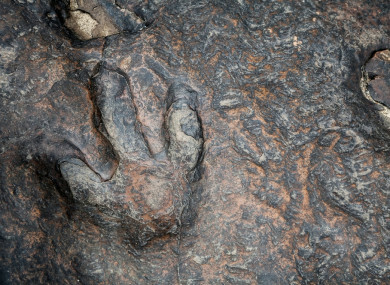 Email “170 million-year-old dinosaur footprints discovered on Scotland's Isle of Skye”. Feedback on “170 million-year-old dinosaur footprints discovered on Scotland's Isle of Skye”.